Mailbox storage is huge (currently 7.5 Gb) and continues to grow. Rather than require you to weed through all of your email and delete messages to conserve space, Google gives you more space. Google's search engine for your mail. You get to use all the Google hacks to sort through your mail quickly. Spam filtering. Gmail uses the fact that spam is sent to so many people to filter it out. It also uses other state-of-the-art techniques to differentiate between what is real and what is auto-generated. Gmail is also available on many mobile devices. Gmail is available over any web connection, but Google has also released native applications for both Blackberry and Nokia S60 phones. Distinguish between kinds of mail using stars, filters, and labels. Google email lets you use multiple means of differentiating between different kinds of messages so you should be able to find what you want quickly. Communicate with other Gmail users via chat, text, or even video. Users that are logged in simultaneously can use other Google technologies to communicate: chat, text, and Google video (if both have webcams). Advertisements are text-based - no Flash or graphics. Gmail is supported by Google's AdSense program. But the advertisements are always text-based, so they load faster and are not as annoying. 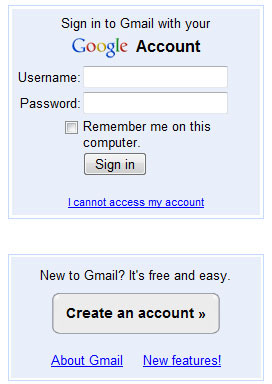 So if you want to sign up for Gmail, browse to the Gmail login page and follow the registration process below. The main Gmail page has the following logo in the upper left: Note that, if it is note there, or if the URL is not secured with "https" and your browser's padlock icon, your browsing session has been hijacked. Otherwise, continue to complete the Gmail sign up form. You will then be presented the this form to complete. This is the only other step in the sign up process, but there are points you will want to note as you complete it. Once you have entered your name and preferred account name, be sure to click on "check availability!". Given that Gmail has millions of users, don't be surprised if your first login is already taken. Gmail will also suggest logins that have not yet been taken. By default, Google sets a permanent cookie on your computer. This is what is meant by "Remember me on this computer". This also means that Google detects that cookie wherever else on the Internet you go that uses any of Google's services. Untick the box if you prefer not to have Google recognize you elsewhere on the Internet. By default, Google takes a record of the places you visit on the Internet that use Google's services. This can create a personalized experience of many websites, but it can also be a bit spooky. If privacy is an issue for you, you want to untick this box. Security question. If you lose or forget your login details, what personal question do you want Google to use to verify that you are who you say you are? Recovery email. If you need a password reminder sent by email, to where should Gmail send it? Location. Where are you? This is needed in order to know what laws apply to your relationship with Google. Captcha. This mitigates against robots signing up for Google email accounts en masse. Terms of Service. You need to agree to Google's terms in order to use the service. Once you have gone through these last bits, click "I accept. Create my account." That's all it takes to sign up for Gmail. Now you have all the above benefits at your disposal and can get started on your Gmail account setup and figuring out how to check Gmail without the web interface. If you still prefer to use a desktop email client, however, check out both parts of "Setting Up Your Email". The Linux kernel is the basic programming foundation for the entire Ubuntu operating system. Here is how it started and why it is called GNU/Linux. Ubuntu comes from an African word that suggests humanity and community. Ubuntu compares well against any operating system in use today, including Windows, Mac, and other Linux versions. Ubuntu can be downloaded or ordered and is available in a couple of versions: 6.06 (Dapper Drake) and 7.04 (Feisty Fawn). Which you use depends on the software you need. This page shows you from where you can download, request, or buy Ubuntu. Ubuntu had many Windows Vista features almost a year before Microsoft released it. Here is how Ubuntu compares to Windows Vista. Windows Vista looks curiously like Mac OS X. NY Times' David Pogue says there is no connection. Ubuntu is the easiest Linux version to install. Here is a guide to installing Ubuntu Linux painlessly. Ubuntu Linux checks for updates by default. If you need to update your installation of Ubuntu for the first time, here is how to do it. Resizing a Windows installation is easy with the Ubuntu installer. Installing Ubuntu in parallel to a Windows installation is called 'dual booting' and is a good idea. Here is how to do it. Ubuntu's history started with Debian GNU/Linux but has since outgrown it. Here is a brief look at Ubuntu's past and how things stand today. Adding Ubuntu software, non-Ubuntu Linux software, or even proprietary software to your new installation is easy with Synaptic. Here's how. Adding Ubuntu repositories to download more Linux software is not very complicated. It is a simple matter of telling Ubuntu where to find more software. Ubuntu software is available in more repositories than the default Ubuntu installation gives you. Here is a listing of more Ubuntu repositories for your software needs. Ubuntu Feisty was released in April 2007. It is the easiest Ubuntu to install yet. Here is how the installation of Ubuntu Feisty is different from 6.06 LTS. Grub boots Ubuntu by default. But if you want to make Windows your default operating system without losing Ubuntu, all you need do is change a number in Grub's configuration file. Here is how. Grub's menu is hidden by default. Making it visible at startup is a matter of editing grub's configuration file. Here is how. Dual booting Ubuntu with Windows or another operating system is not particularly difficult. This guide shows you how to dual boot Ubuntu and Windows. Ubuntu uses GNOME as a default desktop. Here are the top left parts of the Ubuntu desktop and what each does. Ubuntu uses GNOME as a default desktop. Here are the top right parts of the Ubuntu desktop and what each does. Ubuntu uses GNOME as a default desktop. Here are the bottom parts of the Ubuntu desktop and what each does. Installing Ubuntu should be as easy as possible, and the best guides for this are provided here at Easy Ubuntu Linux. But all the online resources in the world do not help you offline. For this reason, we are providing this PDF primer to help you install Ubuntu. Sending e-mail under Linux is easy. Here is how to setup your email identity under Ubuntu Linux. Sending e-mail under Linux is easy. Here is how to receive email under Ubuntu Linux. Sending e-mail under Linux is simple. Here is how to setup Evolution to send email under Ubuntu Linux. Choosing an office suite for your Ubuntu installation is like choosing the first among equals. Here is a comparison of the best office suites available for Ubuntu Linux. Ubuntu upgrades are easy to affect. As usual with Ubuntu, you get to choose how to upgrade. Ubuntu Upgrades are a choice of two straightforward processes. Here is how to upgrade and update all of your programs at once. Ubuntu Upgrades are as easy as the installation. Here is how to upgrade and save your data. Ubuntu's image handling surpasses those of other operating systems. Whether you just need to look at your pictures or create first-rate graphics, Ubuntu offers a program to meet your needs. Ubuntu comes with the GIMP already installed. Here is a brief tutorial on how to edit photos with the GIMP. GQView is an additional photo previewing program for Ubuntu. Here is a brief tutorial on how to preview and edit photos with GQView on Ubuntu. Install Ubuntu with minimal fuss. Some choices in the installation process are better than others, and this section will help you to install Ubuntu with ease. The default Ubuntu configuration is good for most users. However, you will inevitably want to configure Ubuntu to suit your tastes better. Once Ubuntu is setup, you may still wonder about how to use Ubuntu. This section will show you how to setup and use software such as email, office suites, and photo editing software. Apache is the main Ubuntu web server. It allows you to serve web pages from your computer. Here is how to use Ubuntu to serve web pages with Apache. Apache is the default web server on your Ubuntu system. With Ubuntu's Apache modules, you can enable Apache to do a lot more than serve web pages. Here is how to configure Apache modules on Ubuntu. Apache lets you serve web pages from your Ubuntu server. Which of Ubuntu's Apache modules are installed determines what you can do with your web server. Here is how to configure Apache modules on Ubuntu. Apache is a web server available for Ubuntu. With it you can serve web pages from a computer. Here is how to setup Apache as a web server on Ubuntu. Apache on Ubuntu is a web server that enables you to serve web pages. How well those web pages are served depends on the configuration you use. Here is detailed information on the default configuration of the Apache web server on Ubuntu. MySQL is the most common database server in the world. Here is how to install MySQL on Ubuntu Linux. MySQL is the world's most common database server. Here is how simple configuring MySQL can be on Ubuntu Linux. MySQL is the most common database server. Here is the basic MySQL configuration in detail. PHP is one of the main languages used in developing for the Web. It allows you to create web pages dynamically on Ubuntu. PHP is a programming language used with the Apache web server. Configuring PHP well allows you to serve web pages dynamically on Ubuntu. PHP is one of the main languages used in developing for the Web. Here is an in-depth look at configuring it on on Ubuntu. PHP is one of the web's main languages for development. Understanding how to configure PHP allows you to create web pages dynamically on Apache. Ubuntu is not always easy. But Easy Ubuntu Linux helps make it that way. Keep it easy with the Easy Ubuntu blog. A LAMP server is one of the most pervasive types of servers on the Internet, but many people find installing LAMP servers difficult. Here is how to install a LAMP server on Ubuntu. Samba is the main Ubuntu file sharing server. It allows you to share files with others from your computer. Here is how to use Ubuntu to share files with Samba. Samba is a file sharing server for Ubuntu Linux. It allows filesharing with others from your computer. This guide shows how to configure Samba on Ubuntu. Samba is a file sharing server for Ubuntu Linux. It allows filesharing with others from your computer. This is the second page of a guide that shows how to configure Samba on Ubuntu. Samba is a file sharing server for Ubuntu Linux. The [globals] header is part of the Samba configuration file. This guide shows how to configure the [globals] section of the Samba configuration on Ubuntu. Samba is a file sharing server for Ubuntu Linux. The [homes] header is part of the Samba configuration file. This guide shows how to configure the [homes] section of the Samba configuration on Ubuntu. Samba also functions as a printer managing server for Ubuntu Linux. The [printers] header is part of the Samba configuration file. This guide shows how to configure the [printers] section of the Samba configuration. Ubuntu's open source nature allows you to program your computer yourself. Here is an introduction to the ways to do computer programming on Ubuntu. Functional programming is not hard to do on Ubuntu. Here is an introduction to what functional programming is and why this programming paradigm is widely used. Object-oriented programming is one of the most powerful programming paradigms and the hardest to control. Here is an introduction to how to use object-oriented programming on Ubuntu..
Learning PHP is not difficult with Ubuntu. This PHP tutorial helps you begin to learn PHP for Ubuntu. Learning PHP is not difficult with Ubuntu. This PHP tutorial helps you begin to learn PHP for Ubuntu, starting with PHP's keywords. Wine is an emulation layer for Ubuntu. It allows you to run Windows applications like native Ubuntu software. Here is how to use Wine to run Windows applications on Ubuntu. To Learn PHP is not difficult with Ubuntu. In this PHP tutorial, we look at variables and datatypes. To Learn PHP is not difficult with Ubuntu. In this PHP tutorial, we look the importance of PHP's datatypes. Perl's Credit Card module is an effective way to check card numbers on Ubuntu. Here is how to install the Credit Card module on Ubuntu in the fastest and most painless way possible. Processing credit cards is a fundamental process when you do ecommerce on Apache. Here we walk through some of the more common options for credit card processing on Ubuntu. An Ubuntu netbook gives you the facility of a netbook with the advantages of Ubuntu. Here we see the beauty of running an Ubuntu netbook. A netbook is a very small laptop that has lower specifications than the usual lap top. This makes it perfect for Linux. Here we look at the advantages of a Linux netbook. A netbook is a very small laptop that has lower specifications than the usual lap top. Here we look at the netbook and the value of running Ubuntu Linux on one. Learning PHP is not difficult with Ubuntu. This PHP tutorial helps you begin to learn PHP and PHP syntax. PHP loops are not difficult to learn. It is simply a matter of remembering each formula. This PHP tutorial shows you how PHP loops work on Ubuntu. To learn PHP is not difficult with Ubuntu. In this PHP tutorial, we look at PHP constants. To learn PHP is not difficult with Ubuntu. In this PHP tutorial, we look at the value of constants. To learn PHP is not difficult with Ubuntu. This PHP tutorial shows how to test for defined constants and then to define them if they are not a PHP constant. To Learn PHP is not difficult with Ubuntu. In this PHP tutorial, we look at the importance of understanding PHP's expressions. Apache is the main web server provided by web hosting companies. Here are recommendations on which Apache web hosting company to use for your Apache web host. Linux notebooks are not as rare as they once were. It is nonetheless possible to buy a notebook and find that you cannot install Linux on it. Here is a series of guides for how to install Linux on different notebooks. We usually learn PHP as a standalone language, but it can be used in a HTML page. Here is how to embed PHP in HTML for dynamic web pages. To affect PHP hosting requires you to configure Apache to Host PHP. Here we see how to do that. PCI DSS is one of the most important elements of e-commerce. Even if you run your own credit card processing business, you would be forgiven for wondering 'What is PCI DSS?'. This cryptic abbreviation is explained here. Sudoers are those users who can gain administrative access to the system. Their names are listed in the sudoers file. Here is how to be so registered if your username is not in the sudoers file. The PCI DSS requirements cover the salient aspects of data security set by the payment card industry. Here we look at the requirements of the PCI DSS. The PCI DSS requires network security in the first instance. Here are the two requirements of the PCI DSS that focus on network security. The PCI DSS requires a secure firewall in the first instance. Here is the PCI checklist for securing your network. The PCI DSS requires network security down to the system level. Here is what to look for when evaluating your systems for network security according to PCI DSS requirements. The PCI DSS requirements for network security are not self-explanatory. Here is the PCI checklist for securing your network according to PCI DSS requirements. The PCI DSS requires protection of credit card data in multiple ways. Here is how to protect credit card data according to PCI DSS requirements. Credit card data protection is the second set of PCI DSS requirements. This checklist helps you to ensure you are compliant with the PCI DSS requirements on credit card data security. Credit card data protection is the second major set of PCI DSS requirements. This second component deals with how to protect credit card data in transit according to PCI DSS requirements. Credit card data protection is the second major set of PCI DSS requirements. This checklist will help you to ensure your are compliant with PCI DSS requirements for credit card data protection. Sign up for Gmail and get several benefits for free. Here is how to sign up for Gmail for free. Email solution on Linux vary according to how much control and accessibility you want to have. Here we see what is available for email solutions under Ubuntu Linux. Install Ubuntu 10.04 (Lucid Lynx) with minimal fuss. Some choices in the installation process are better than others, and this installation guide will help you to install Ubuntu 10.04 (Lucid Lynx) with ease. OpenOffice Writer is the wordprocessing application of the OpenOffice office suite of productivity applications. Here are the basics of using OpenOffice Writer. To reset password in Ubuntu is used with root access and without. Here is how to reset password in Ubuntu. To add users in Ubuntu allows for a true multi-user system. Here is how to add user in Ubuntu. The PCI DSS vulnerability management addresses all forms of malware - viruses, worms, and Trojans. Here are the stipulations of the PCI DSS with regard to management of known vulnerabilities. This PCI DSS vulnerability management checklist addresses the same kinds of malware that the PCI DSS requires. Here the stipulations of PCI DSS vulnerability management are put in practical terms. tag. Details of this can be found on this page. Does your computer make you this happy? Easy Ubuntu Linux and the Easy Ubuntu Linux logo ©2006-2011, LCS. Ubuntu ©Canonical, Ltd.
All other trademarks and logos are the reserved copyright possessions of their respective owners. Unless otherwise stated, all material contained on this website is copyrighted to Easy Ubuntu Linux.com. All rights are reserved. All content is provided AS IS without any warranty of any kind for any purpose. (remove single quotes and replace "@" for " (at) ").